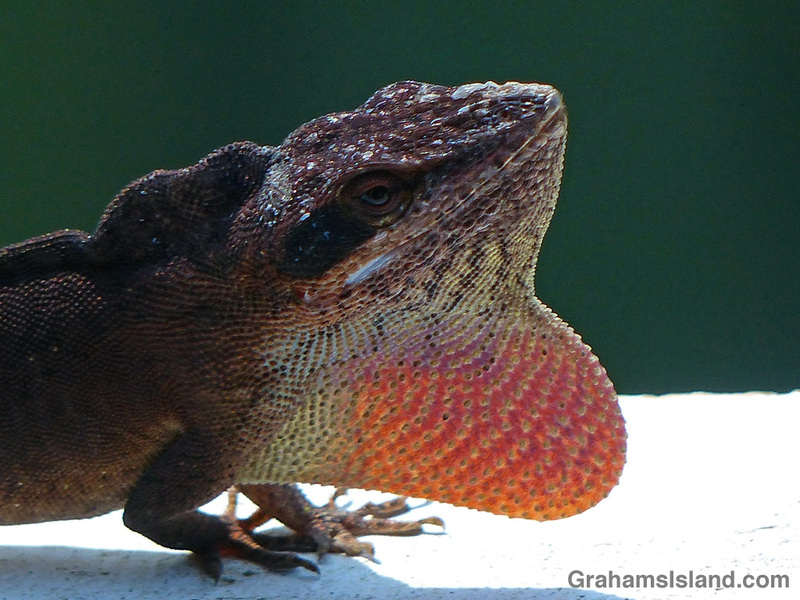 I saw this anole on the lanai one day and thought at first it was something new to me. It was a very deep brown with pronounced markings and it had a raised ridge on the back of its neck that I’d never seen before. It was already pretty agitated, but my taking photos riled it even more, causing it to strut around and puff out its dewlap. After watching it for a while, I thought it had a lot in common with the green anoles I see around here, and sure enough, its color started to fade and then shift to green. I suspect what was happening is that it was trying to stake out a new territory and was moving in with the most impressive display it could muster. I’ve found out since that the raised ridge is one such display technique that green anoles have. I didn’t see it again. Probably it decided that it didn’t need a territory already crawling with paparazzi. Beautiful! This was my favorite lizard growing up in Texas. Thanks. I like them too and they have very different personalities to the geckos.